My first trip to Chile happened in 2002, and I was scheduled to use the newly built Magellan "Baade" 6.5 meters aperture telescope. Getting time on large telescopes is hard, so the usual observing runs at facilities like the twin Magellan telescopes don't last more than a few nights. If you get good weather you return home with a treasure trove of data which will feed your research for months. If the gods of rain are instead against you... well you have gone all the way to the end of the world, and back, for nothing. My 2002 trip to Chile was however different. I went there to help testing a camera never before used on that telescope, so we had plenty of engineering time to debug our instrument. Lots of time: a 20 nights run. Spending such a long period at the telescope is cool, until of course you realize that for that same long time you are stuck on top of a mountain, in some deserted isolated place. Salvation in this 2002 run came in the form of a friend of mine, Grzegorz, an astronomer from Poland working for the Optical Gravitational Lensing Experiment (OGLE). 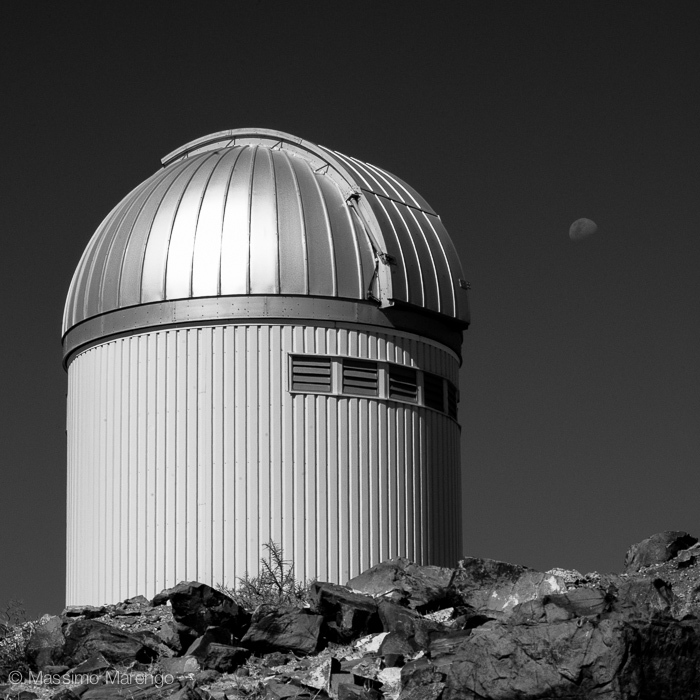 This project uses the small telescope shown in the photo on the left. OGLE is a very cool program, scanning the sky in the search of a rare phenomenon in which a star acts as a lens for a background object. The physics of the phenomenon is related to Einstein's General Relativity: massive objects deflects light due to their gravitational field. Even the Sun does it: if you could see the stars during daytime you would notice that the ones near the Sun would appear in a slightly different place than where they are supposed to be. This is an experiment that you cannot normally do, because during daytime there is no way to see the stars. Except of course when there is an eclipse, in which case the glare of the Sun is blocked by the Moon and you can see the sky behind as if it was night time. This measurement was in fact first accomplished in 1919, and was the first test to demonstrate the validity of Einstein's theory of gravity. OGLE tries to do the same but using other stars rather than the Sun, when they randomly align with stars farther away. This is an extremely rare event, because it requires an almost perfect alignment, but if you look continuously at a large number of stars, sooner or later you are bound to get lucky. For this reason OGLE looks at the two Magellanic Clouds (dwarf galaxies close to the Milky Way) and at the bulge of our own Galaxy, where millions of stars can be surveyed without having to cover an impossibly large area. When one of this millions of stars flickers because of this gravitational lensing effect, one can derive the properties of the lensing object from the characteristics of the flickering. With this techniques we can see very faint stars that we would not be able to detect directly, and count them, which is important to have a reliable census of the kind of stars that populate our Galaxy. Sometimes we even get some surprise: in some rare cases these flickering events may be followed by a secondary, fainter flicker, due to a planet orbiting the star that caused the primary lensing event. One month ago the OGLE people got an even bigger surprise: a peculiar lensing event that could have been caused by a "free floating" giant planet with an Earth-size exo-moon, roaming the Galaxy alone after having been ejected from their native planetary system. This could be the very first detection of a moon in another solar system. Given the nature of the OGLE survey, Grzegorz is often stuck at Las Campanas Observatory for months on end. When that happens he bring to the observatory his whole family, which in 2002 meant his wife and a very young child. It also means that he has a car, which is a necessity if you need to be able to get away from the self-contained, but very utilitarian, environment of the observatory. Which brings us to the second part of the title of this story. At some point during their stay, Grzegorz run out of diapers for the kid, and decided to drive down the mountain in a quest for diapers in the villages around the observatory. I went along with him. You can imagine how the search went. As described very well by Kelly Clancy in this essay, the area around Las Campanas is a dry highland desert. The only inhabited centers that you will encounter along the Panamericana highway that is crossing the region are tiny villages with tin-roof houses. They are mostly living off subsistence agriculture adapted to the very arid climate of the area. 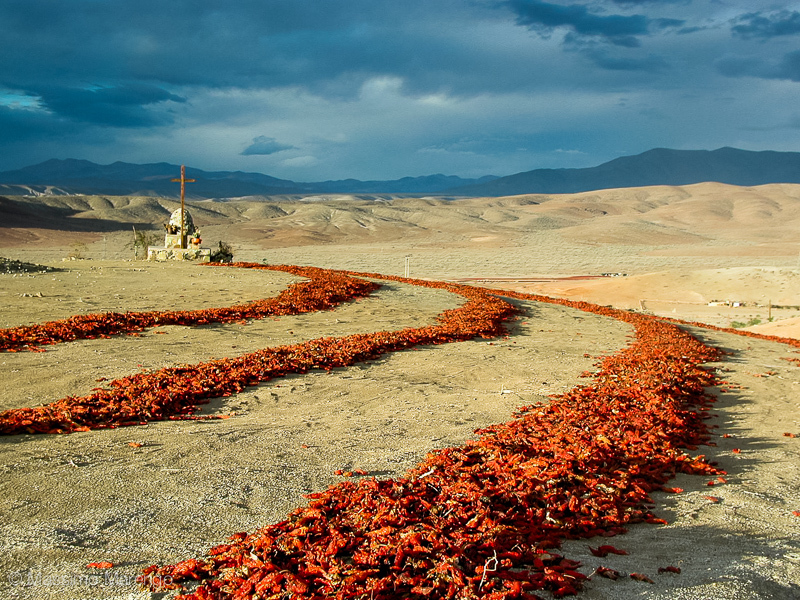 The large photo on top and the panoramic at the bottom show the typical landscape: naked mountains crossed by dirt roads, and in the fall season rows of aji peppers left to dry under the Sun. The villages have only small stores where you can find basic needs products. While that apparently includes lots of Nestle canned food, the inventory doesn't really include single use diapers: these are luxury items that make very little sense when you can rather use a washable cloth, reusable as many times as you want. It didn't take long to realize that the people we asked for the diapers were quite baffled by our inquiries. Diapers (or the lack thereof) are a #FirstWorldProblem. 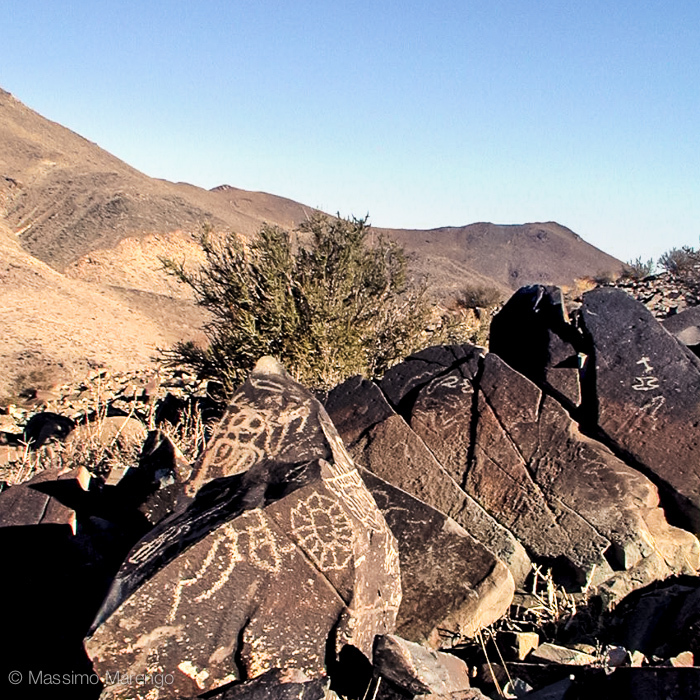 In the end we did find some temporary solution to Grzegorz's problem, and drove back to the observatory, but not before stopping on a side road where we saw the petroglyphs in the small photo on the right. As it happens, the Panamericana highway retraces the the same route of an ancient Inca trail, a road that for a thousand years has enabled the commerce between the center of the Inca civilization in Cuzco, and these villages at the periphery of the empire. These same villages are still there, and they will still fight the parched highland desert well after we will have abandoned our telescopes and returned to our ivory towers.